Cleveland Clinic’s website states the following: “Waste, by definition, is to ‘fail to take advantage of or use.’” But this medical center’s innovative and ambitious waste management program is rejecting that definition with a wide-ranging program that’s taking every advantage of more than 35 different waste streams, to much success. Cleveland Clinic is comprised of a 167-acre main campus made up of 44 buildings, as well as 10 regional hospitals and 19 family medical centers across Northeastern Ohio, and the globe. Cleveland Clinic has an excellent reputation for leading-edge medical care and research, but facility executives across the country could learn from the hospital system’s innovative approach to waste management, too. 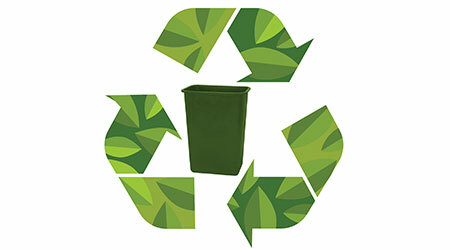 For the past 10 years, the Cleveland Clinic Office For A Healthy Environment has had an inter-departmental zero waste committee with the ambitious goal of reaching a 100 percent landfill diversion rate for all of the hospital’s non-hazardous waste. The medical center is well on its way to achieving that goal. Since 2014, Cleveland Clinic has diverted about 47,000 tons from the landfill. In 2017, the landfill diversion rate, including construction and debris, was 36 percent. In 2007, leaders at Cleveland Clinic noticed that unused and expired products were costing the hospital a pretty penny. In response, the medical center initiated the First In First Out (FIFO) program. Similar to the accounting principle of the same name, the primary focus was to ensure that older products with closer expiration dates were at the front, rather than pushed back. In the end, the FIFO project saved Cleveland Clinic more than $10,000. Following that success, Cleveland Clinic embarked on a second project that looked at waste created at the bedside. The program that addressed this problem was called Unopened/Unused. Unopened and unused products from the bedside were donated to non-governmental organizations that desperately needed these materials, thus diverting them from the landfill. After the success of the second project, Cleveland Clinic’s waste management program was officially on a roll. In 2008, as more employees became involved, the Office For A Healthy Environment was created to carry out the sustainability legacy. Cleveland Clinic made a commitment to reduce the amount of waste the medical center generates and to divert as much waste as possible away from landfills. In addition to standard practices of waste management and traditional recycling programs, Cleveland Clinic practices source reduction, training and partnerships with local businesses to develop recycling markets. Cleveland Clinic has reached out to local businesses for guidance when it comes to waste stream challenges. “We get more information about whether the different materials hold value in the markets and try to build sustainable programs that achieve triple bottom line success,” says Utech. The medical center has 35 distinct waste streams, with 45 different vendors that handle those streams. The hospital system has been intentional about building strong partnerships with vendors that center around their zero waste goals. One of the biggest success stories is their partnership with a paper shredding company, which ensured that all Personal Health Information would be safeguarded while achieving paper recycling goals. The medical center collects between 4,000 to 4,500 tons of paper a year to be recycled, saving around 75,000 trees, annually. The medical center has also been able to divert an average of 77 percent of construction waste from the landfill.